Crafted in our own bakery with a special recipe from The Royal Touch, this classic apple marionberry crumble brings a delicious taste of England to your own kitchen. 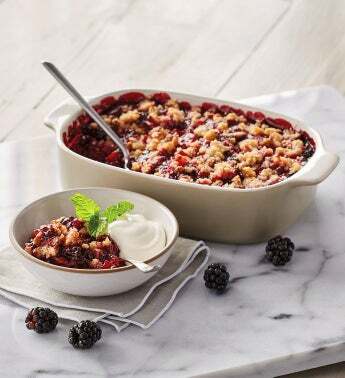 A base of fresh granny smith apples and marionberries are baked to perfection with an aromatic topping featuring pecans, rolled oats, cinnamon, vanilla, and butter. Ready to heat and serve with ice cream for a scrumptious dessert, or with a cup of tea for an afternoon treat.